The snow grew deeper, and we wondered if it would ever stop, and by Saturday afternoon I decided I should begin the gargantuan task of digging out our Suburban. Our four oldest kids joined me, though they were clearly on the side of the blizzard, throwing snowballs into my shoveled pathways and jumping from pile to pile, causing avalanches to fill in the trails I had so recently cleared. I was part snow digger and part scarecrow, waving my shovel, frightening them off. We ended up with just under 30 inches of snow. On Sunday afternoon, I finally finished disinterring our vehicle from its icy grave. The snow around it was up to my chest. I sent Abra and Sammy on to the roof of the truck to clear it off. After about five hours of digging, it was nearly free, and there was a path to the house. My job was done. Late Sunday afternoon we drove to my parents, breaking free from the parking spot I had spent so long clearing. Heavenly Father, I prayed out loud as we drove away, please make that parking spot invisible to anyone who is looking for a space before we return. Amen. I was mostly kidding. Maile laughed, but I’m not sure if she was laughing at the prayer or the chances of the space being empty when we got back. More fun, more snow, a little football, some time holding my sister’s twins, and then we were driving home, around 9pm. I’m not sure what I expected to find…one lone, empty space still sitting there? Would every single person on my street looking for a space see that empty gap along the sidewalk and think, Someone spent a lot of time clearing that, so I’m going to leave it for when they get back? As we came up James Street, there it was: some kind of small, four-wheel drive vehicle snugly (it felt more like “smugly”) parked in the spot I had spent so much time and effort clearing. There were no open spaces on the block. I sighed. 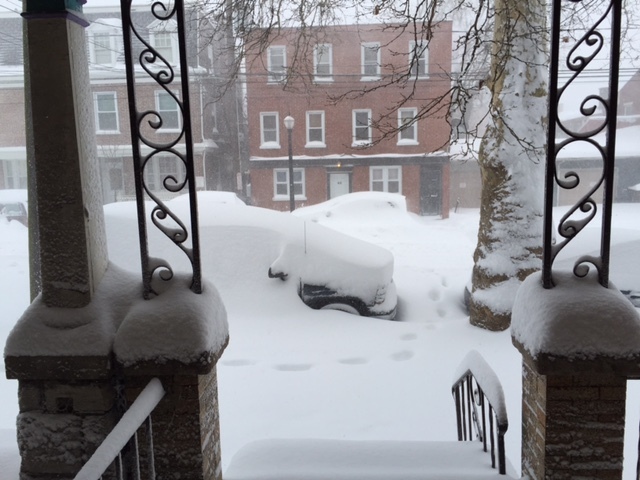 I dropped off my pregnant wife and our five kids, drove around the block to the parking garage, parked on the fourth floor, walked down three flights of steps, slid my way back up the hill to our house, and walked down the sidewalk (part of which had not yet been cleared by the neighbors, in spite of the city’s snow-clearing policies). I pushed the bitterness down as best I could but it still got to me, sort of the way you try not to throw up when you’re sick but still feel the burn in your throat. I wonder though. I wonder about the questions I was asking on the drive back into the city Sunday night, before I knew if someone parked in the spot I had cleared. What kind of a person steals a spot they haven’t cleared? What kind of a person rides on the back of someone else’s hard work? Why didn’t I stick some furniture in the space, blocking access to it? Wouldn’t it be great if someone who really needs a good parking space finds mine empty? What can I do to help an elderly person or a sick person find my spot tonight when I’m gone? This is the blessing of living in the city, of living in community. No matter how much we want to, we can never completely isolate ourselves from our neighbor. No matter how hard we try, we cannot claim these public spaces as our own. We have to learn to live side-by-side, to offer grace, to think the best of one another. This is a gift, this snow, these “stolen” parking spaces. Trust me. This is a gift. Oh my, this brings back many memories of parking space “scuffles” from our days in the city. It (clearing and then not reserving a space!) is an opportunity, and it sure does reveal what is in the heart. Thanks for your writing, Shawn.